For storm shutters in Fort Walton Beach, Florida, the company to turn to is Majors Home Improvement. We are a local, family-owned company that prides itself on installing high-quality products designed to improve the comfort and functionality of homes. We have been serving customers since 1997 and hold an A+ rating with the Better Business Bureau, so you can trust you are in good hands when you turn to us for protective storm shutters for your home. Having these products installed is the best way to protect your home and your family in the event of a storm. Well-made shutters are designed to be easy to deploy when a storm threatens, so you won’t have to worry about a complicated setup. They can complement a home’s overall look, boosting its curb appeal. They are easy to maintain throughout the years, not requiring hours and hours of upkeep. When you turn to Majors Home Improvement for hurricane shutters, you’ll be able to choose from several great styles, including Bahama, accordion, rolling, and colonial. The shutters you select will be custom-configured for your home exactly and meet Miami-Dade County Building Code requirements. Best of all, they will come backed by a warranty protecting parts and labor. 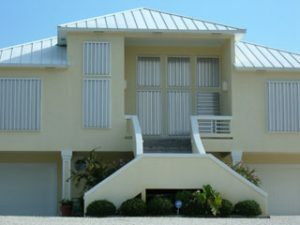 If you’d like to learn more about the storm shutters we install for homeowners in Fort Walton Beach, FL, and nearby cities, contact Majors Home Improvement today.